Card Embroidery is an original technique which allows you to create a personal work of art . It is easy to do, clean, portable, therapeutic, does not take up much space and the results are dazzling. The main technique required for Card Embroidery is Pricking, Embroidery and Finishing. Place your card face up on top of a pricking mat and position your chosen pattern on the card. If the design is from a book use a photocopy. Pierce all the dots with a very fine pricking tool ensuring to keep the tool straight to make clear holes, making a large hole for multiple threads. If you make a mistake while pricking the holes, place a small piece of sellotape on the back of the card covering incorrect holes and continue piercing. Before removing the pattern hold up to the light to ensure all holes in the pattern are pricked. Work step by step following the instructions given with the pattern. Start by threading the needle (suggested thread length 30 inches or 70cm) and insert the needle through pierced hole from the back at the starting point. 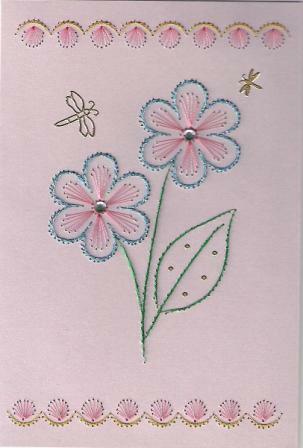 Leave about 1/2 inch or 2 cm of thread and attach to the back of the card with a small piece of sellotape. Various stitches are used. The Flat stitch is a stitch to move from dot to dot. The Stem stitch is used to generate curved lines. When the embroidery is finished leave about 1/2 inch or 2 cm of thread and attach to the back of the card with a small piece of sellotape. Fold the embroidered card and the cover sheet in half. Using a glue stick, attach the cover sheet to the back of the card. to cover the threads from the embroidery.